"There are two Miss Douglas' daughters of the Governor and of course the greatest flirts in the island and I certainly have very little desire to make their aquaintance in consequence." "We were invited to a dejeuner at the Governor. 3 ladies and 10 gentlemen. Mrs. Douglas never appears and her two daughters, aged about 22 and 18 respectively, they say make her do all the domestic work, while they sit in the Drawing Room doing nothing." -- Lt. Anderson, Pilgrim's Rest, 14 Apr. 1860. "The Governor's daughters have a great weakness for saying they are out, when visitors call in the afternoon, and as everybody knows that they must be at home (Victoria being so limited that no one can go out without somebody and very soon everybody knowing it) the servant who answers the door is very often put to a severe cross-examination as to the whereabouts of the aforesaid young ladies who are known to be listening behind the curtain of the adjoi ning window, and the servant is often informed thast he is telling a white lie. I believe one of our officers has got into a disgrace for he happened to be calling at their house with a naval officer who came tosay Good bye before going to England. The young ladies were reported "out" as usual whereupon the naval man wanted to put P.P.C on the corner of his card, so his companion, knowing that the ladies were behind the curtains, having caught a glimpse of their faces in coming up the avenue, remarked, "Its no good putting P.P.C. for they won't understand it", and they have been pretty cool to him since, but I daresay they could not help laughing, at the time." -- Lt. Anderson, Pilgrim's Rest, 23 April 1860. "I was invited to luncheon with the Governor and when I got there I found there were 14 gentlemen and only one lady besides his two daughters. Nevertheless I had a long chat with one of the daughters and after it all I came to the conclusion that she was a born idiot. The other daughter had a propensity for laughing at any little peculiarity of their guests before their face, tho' I never caught her doing so at me, or else i should certainly have spoken to her, and asked her what she meant by it. -- Lt. Anderson, The Dalles, 27 May 1860. On 8 May 1860, Agnes Douglas married Arthur Thomas Bushby. "The Governor has, at last, hired a house here, he was here all last week with his eldest unmarried daughter Agnes, she is such a big (2 underlines) woman aged 19 - very like Theodosia Metcalfe, tho' even less refined. The Governor went up the River on Friday and left Agnes with us till last night when the boat left for Victoria. We had asked her so often to comeand she would not come up here that tho' she gave me many broad hints she wished to prolong her visit to NewWest - I would not ask her to do so, and it was only after her Father determined to go up on Friday that Agnes volunteered to come to us for two nights. The Gentlemen amused her so that I had no trouble in that way." I went out to call on the Governor but luckily he was out. Great preparations were being made for the marriage of his eldest daughter on the following day, and as soon as they heard of our arrival we were all duly invited. Unfortunately I had to sit on a Court martial in the morning so it was impossible for any of us to get away in time for the breakfast at 1/2 past 2, but 2 of the others went up and arrived there after 3 after all the speechifying was finished and they breakfasted by themselves. The ladies were dressed most gorgeously, so Wilson told me for he was one of the two that went up: eight bridesmaids and eight groomsmen amomg whom were some of our brother officers from New Westminster in red coats and cocked hats. After breakfast the bridegroom sat down and played the piano for all the rest to dance to, till sunset when he played God Save the Queen and packed everybody off. They were not going away to spend their honeymoon, as the Governor said he could not spare his daughter. The young lady is rather strong minded and appears among her freinds on horseback or out walking or at home as usual. I am sure the husband is a miserable man already." -- Lt. Anderson, Victoria, 13 may 1862. "We (Lady Franklin and myself) were engaged today to take luncheon with the Governor's Wife, Mrs. Douglas, in place of paying her a formal visit. Have I explained that her mother was an Indian woman, and that she keeps very much (far too much) in the background; indeed it is only lately that she has been persuaded to see visitors, partly because she speaks English with some difficulty; the usual language being either the Indian, or canadian French wich is a corrupt dialect. At the appointed time, Mrs. Dallas came to introduce a younger sister Agnes, who was to take us up to their house. She is a very fine girl, with far less of the Indian complexion and features than Mrs. Dallas. Considering the little training of any kind these girls have had, it is more wonderful they should be what they are, than that they should have defects of manners. They have never left Northern America, nor known any society but such as they now have - in fact they are only now, during the last 2 years since the Colony began to increase, within reach of any society at all beyond that of the usual few employees of the Husdon's bay Company attached to the fort. Agnes Douglas is engaged to be married to a very nice young man (as we hear) Mr. Bushby, who is made registrar (of something) at New Westminster in british Columbia. He has left his card (being here a few days) with his London address (halkin St.) on it." 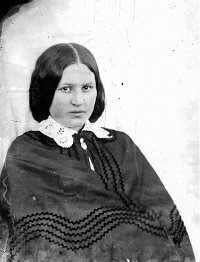 -- 28 Feb 1861, Sophia Cracroft.